I must give Sue Donovan credit for the title. One night she and John did have a hot water bottle. Irene and I would have had one however we left it too late to order. What a contrast! We departed La Libertad at around 14:00 for the road trip to Guayaquil and the new international airport. It rained all the way and we drove through rivers and streams to get there. We have great pictures but without wifi I can't get them to the blog site. Sorry Guys!. What we didn't realise at the time was that we were driving through the start of one of the biggest natural disasters that Ecuador has suffered in recent years. 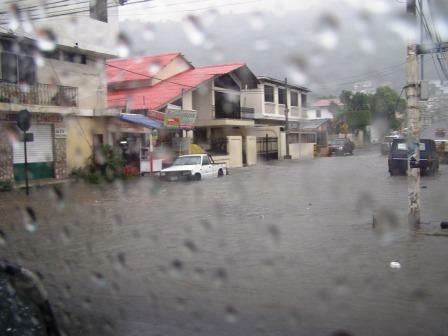 By the time we got back to Guayaquil four days later it was isolated in a virtual sea of flood water which stretched as far as we could see in any direction as we approached the airport at 1000 feet. It was so hot while I was packing that I completely ignored sage advice from our travel guide. I threw in a pair of chinos, 3 or 4 light cotton shirts, a light weight jacket and some shoes. No sweater or even any socks! Arrived in Quito and it was 17 degrees C and raining. First call somewhere to buy socks and maybe a sweater. Socks were OK but a sweater just didn't come big enough to fit my 44" chest. Let me tell you about a good thing that happened to us in Ecuador. We were introduced to Centro Viajero a travel agent in Guayaquil run by Douglas Chang. Douglas is a third generation Ecuadorian of Chinese ethnic background. 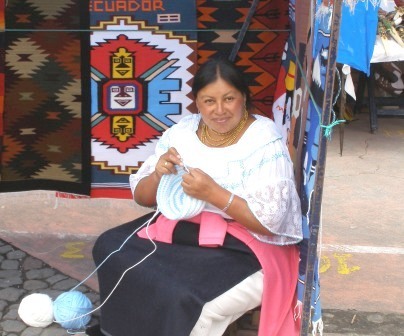 His grandmother was sold into servitude here in Ecuador and they have been here since. Douglas was educated here and did his masters in the US many years ago. Douglas hired out to us as a guide and organised cars & drivers wherever we went. Car picked us up at the Quito Airport and conveyed us to The Hotel Quito (5 stars although slightly tarnished). After checking in Douglas had us driven to a great restaurant San Telmo and he and driver waited for us to finish our meal and drove us back to the hotel. Gonzalo Proano, was our host and spoke impeccable English. He made us most welcome, recommended his favourite dishes, served us some magic wine with the offer, drink and pay for one at the restaurant and the take a second one home. Great marketing gimmick. Our guide & driver were suitably impressed with their present for that night's work. Quito is interesting. The original name was Quitsa-to meaning 'middle of the earth'. 3000 metres (10,000ft) above sea level, I immediately got a high altitude headache and talk about puffing and panting. 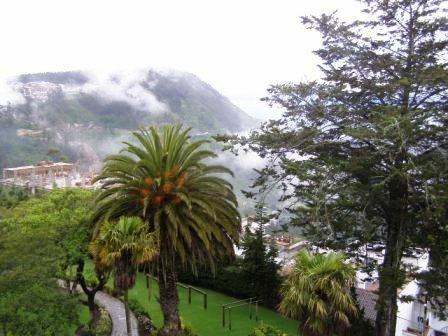 Quito is the only site on the planet where the equator crosses highlands, on the rest of the planet it crosses jungle or oceans. It was this height which gave the pre-Inca cultures their predilection for astronomical discovery. The Pichincha Volcano (15,000ft) is to the west, Antisana (18,700ft) to the east and the snow capped Cayambe (18,725) to the northeast and almost precisely on the equator. Quito is a long thin city around 22 miles long by 2-3 miles wide. The city is a World Cultural Heritage Site. We visited the San Francisco Church built in 1536-1580 and this construction commenced only 2 years after Sebastian de Benalcazar conquered Ecuador. The hammered gold leaf used in this church is astonishing. The intricate wooden carvings are all covered in gold! 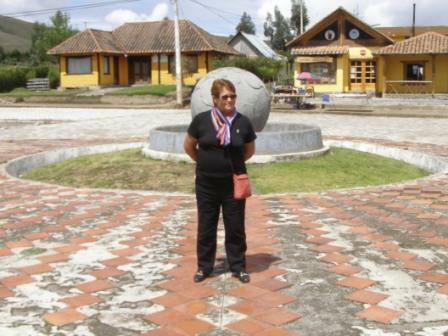 Not far from Quito at San Antonio de Pichincha is the Mitad del Mundo City built right on the equator. You can stand with one foot in the northern hemisphere and one in the south. From Quito we drove north through the Pichincha Mountains to Otavalo and Cotacachi, the Culcocha Lake which is an impressive crater lake of deep blue waters and with the revival of the Condor from near extinction they can sometime be seen. 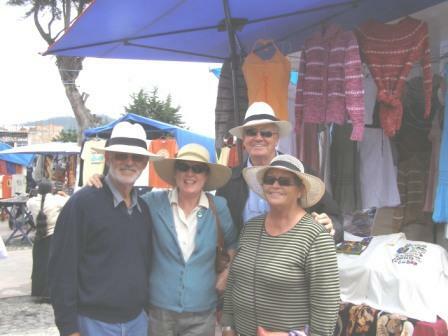 The Otavalo Indigenous Market has an impressive array of all kinds of Ecuadorian handicraft including of course the ubiquitous Panama Hat. See evidence below. Two nights in great hotels and Douglas found us some very enjoyable meals. All in all a great three days during one of the largest floods Ecuador has had in recent times. The one disturbing item was the number of 'private police forces' and the varying number of public police forces and they are all armed. 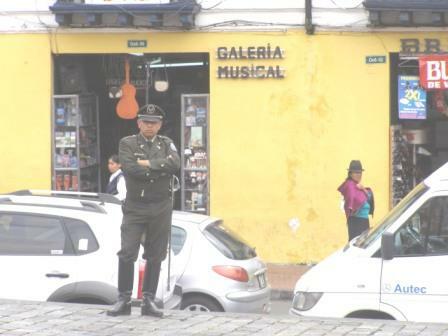 Private Security forces guard and protect private property and are out in force in the streets all in slightly different quasi military uniforms while the public police forces have a myriad of different uniforms, Douglas could identify them but it is bewildering to a tourist. The Puerto Lucia Yacht Club Marina is a doozy. 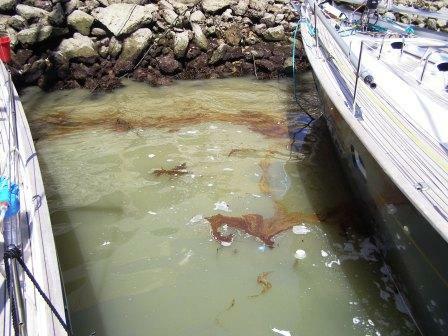 Because of all the rain the marina was oozing with oil which was leaching out of an adjacent abandoned oil field. When we arrived, they issued us with sacrificial mooring lines to soak up the oil. We were moored bow to a rubble wall and our sterns to a series of mooring buoys. We had to use the dinghy to gain access to the shore. What a bloody mess! The mooring lines would soak up the oil and then smear it all over anyone whose dinghy was left in the water, our hose is now permanently stained yellow where it was in the water and I abandoned our 15amp electrical power extension as it was just too dirty to consider cleaning. The marina staff cleaned the water line and part of the hull of oil prior to our departure as they would not have let us into the islands with the hulls coated in crude oil. Yuck! Panama Hats all round. It was very cold in the mountains. 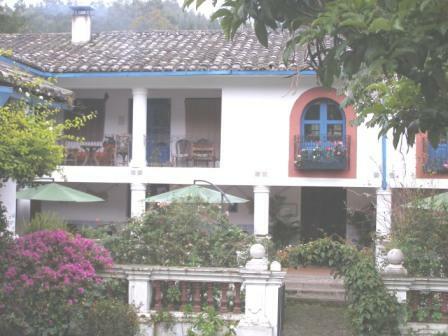 The Hacienda Cusin - one of our hotels. That's the equator between Irene's feet. 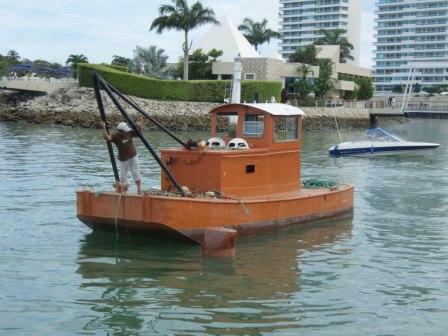 The surge was so bad that we kept dragging the mooring buoys and they kept moving them back again.